North Carolina is known for its legendary barbecue joints. We proudly continue this tradion by serving authentic whole-hog, pit-cooked barbecue at The Pit in downtown Raleigh and Durham. In our humble opinion, great food and great hospitality are all it takes to make someone feel at home. Our fondest memories take place around the kitchen table, and we think yours should, too. This is how we define ourselves: by each guest’s experience in our home. It’s a family dinner at Gravy, a beer with friends at the Raleigh Times, a celebration at The Pit, a cocktail at Sitti, a quiet coffee moment at the Morning Times. We’ve been called a lot of things, but ordinary isn’t one of them. We pride ourselves on fresh, local, seasonal eats and chef-driven concepts rooted in truth, not trends. So, grab a seat and get comfortable. There’s always room for more at the table. 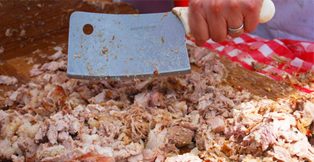 The Pit is a celebration of all of the great culinary offerings of the Old North State. Authentic North Carolina barbecue is our signature dish. Whole hog, pit cooked over charcoal and wood. You’ll get a fine dose of Southern hospitality when you walk through the doors of our beautifully restored warehouse-now-restaurant. Since 2007 (and cooking hogs for decades before that), we’ve made a name for The Pit as the go-to place for what many say is some of the best our state has to offer. Our barbecue starts with the freshest hogs, raised by local North Carolina farmers using animal welfare approved farming practices. Our dedicated pitmasters then cook the pigs around the clock to bring you the best barbecue you’ll find in these parts. We also bring you the freshest of the North Carolina’s bountiful produce in our starters, sides, and desserts. And as much as we love our traditional barbecue, we also enjoy sharing some contemporary twists on tried and true favorites, serving Texas-style brisket, baby back ribs, barbecue turkey, fried chicken, and a can’t-miss barbecue tofu dish. 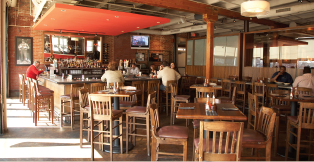 It’s all served up in an easy-going and fun downtown setting with traditional Southern hospitality. If you’ve got a powerful thirst for a beverage, we invite you to choose from an excellent selection of handcrafted beers, specialty cocktails, single batch bourbons, and wines, all of which have been handpicked to enhance the smoked and sometimes spicy fare cooked off the pit. Whether you’re visiting from around the corner or around the world, we’ll keep the fires burning, so you’ll always have a home for your barbecue pilgrimage. Grab a seat and get comfortable. There’s always room for more at the table. Greg Hatem grew up cooking pigs each Fall in Halifax County, so it was no surprise he later opened The Pit in Raleigh, honoring the state’s best known and much cherished culinary tradition. With his love and passion for barbecue and North Carolina, Greg paid painstaking attention to every detail in the creation of The Pit in both Raleigh and Durham, including sourcing hogs from local farmers and producers. The founder of Empire Eats, a sister business to Empire Properties real estate development, Greg has been credited as a primary initiator and ongoing contributor to the revitalization of downtown Raleigh. Empire Eats’ other restaurants that also are part of the evolution of Raleigh into a thriving culinary center include The Raleigh Times Bar, The Morning Times Coffee Shop & Gallery, Sitti (honoring Greg’s Lebanese heritage), and Gravy (Italian) restaurants. Greg has been a passionate, creative force behind each concept, for which he also is involved in the recruitment of chefs, financing, design and décor, and non-traditional marketing, for which Empire Eats restaurants have come to be known. Bob Garner shares our passion for historic and cultural preservation, including nurturing our state’s historic foodways…and most especially our rich barbecue legacy. At the restaurants, on the web, at special events, and through the printed word, he joins us as enthusiastic caretakers of this colorful segment of our popular culture. Each of our farmers is regularly audited to ensure they meet Animal Welfare Approved standards. The basic premise of all the AWA certification is that animals must be able to behave naturally and be in a state of physical and psychological well-being. Employing the most rigorous standards for farm animal welfare currently in use by any United States organization, AWA ensures pigs are raised outdoors, and without the use of antibiotics, growth promotants, or animal byproducts. Given only to family farms, the AWA approved label verifies participating farms are putting each individual animal’s comfort and well-being first. AWA is the only free, third-party animal welfare certification program, and it offers both technical advice and marketing support, and works to revitalize a culture of independent family farms, on which a humane ethic can be passed on to future generations. An annual audit by the AWA covers everything from birth of piglets to the processing of the animals for consumption. Caleb Johnson is a graduate of North Carolina State University with a degree in Agricultural Business Management. Upon graduation, Caleb joined his father Anthony Johnson — who has nearly two decades of experience raising pasture-raised pork — in tending some 50 sows on their farm near Garland, N.C., in Sampson County. Caleb grew up on the 600-acre farm, where in addition to raising the sows, he, his father, and his mother Marry Anne oversee the raising of corn, soybeans, wheat, some beef cattle, and 65 acres of blueberries. The Johnson’s raise their pigs keeping Animal Welfare Approved standards, and the family likes having a stamp of approval from an organization not directly associated with the farm. Jack Ward has a deep background in the practice of pasture-raised pork. Jack’s father, grandfather, and great-grandfather all farmed the family land near Seven Springs in Wayne County, and Ward’s son Daniel now represents the fifth generation on the farm. The operation, which encompasses approximately 400 acres, is devoted to raising corn, wheat, soybeans, tobacco and beef cattle, in addition to the care of around 25 sows and their litters. Sure, The Pit is a Raleigh must-see—but our notoriety extends far beyond the Triangle, and with good reason. Chalk it up to our secret recipes, our passion, our service, our style—whatever it is, it just keeps getting us noticed. Our barbecue, ribs, and Southern sides have helped us get plenty of attention from the media. We won a rib challenge on Food Network’s Throwdown with Bobby Flay. 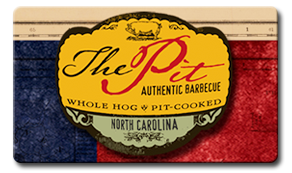 The Pit has been on The Travel Channel’s Man v Food, and was included in a barbecue cook-off on NBC’s The Today Show. The restaurant also has been included in cooking segments on ABC’s Good Morning, America, on CBS’s The Morning Show, and has been featured in Bon Appetit, Southern Living, Men’s Health, GQ, Imbibe, Delta Sky, and Food Network magazines. Staying involved in the community—our local community as well as the barbecue community as a whole—is very important to us at The Pit. After all, our best customers are our friends, neighbors, and fellow barbecue enthusiasts. So whether it’s at a local gathering or on national television, we take any and every opportunity to recognize our peers, compare notes, and show our Pit pride. We’d love for y’all to join us! Legendary barbecue is as much art as it is science—and learning how to do it doesn’t happen overnight. Even so, The Pit offers some tips and tricks to achieving barbecue greatness, in true eastern North Carolina style. In Raleigh, NC, chef Darrell Brown dishes out his own region’s style of barbecue at The Pit restaurant, which he says is far superior. The North Carolina ‘Cuegrass Festival Each April, The Pit’s Annual ‘Cuegrass Festival returns to downtown Raleigh’s warehouse district. It’s a jam-packed day full of great ‘cue, local brews and toe-tappin’ bluegrass music! And it’s always for a good cause. Over the years, we’ve raised more than $50,000 for nonprofits in North Carolina, including N.C. 4-H, the Junior League of Raleigh’s BackPack Buddies, and local farmers raising Animal Welfare Approved livestock. On the stage over the years, we’ve had some amazing bands, including American Aquarium, Big Daddy Love, Delta Rae, Jupiter Coyote, Justin Robinson & The Mary Annettes, Old Habits, Southern Culture on the Skids and Tres Chicas. Check back here in Spring 2014 for information on our 6th Annual ‘Cuegrass Festival. Our Heritage Dinners, co-hosted by Bob Garner and Executive Chef & Pitmaster Darrell Brown, are a great opportunity to showcase and honor leading, living figures in North Carolina barbecue history. They’re fun, educational, emotional, and delicious! Barbecue fans have the privilege of hearing these legends of barbecue reminisce about their experiences in the barbecue craft, their hopes and expectations about its future, and their feelings about being a part of the tradition. Seating for these events is very limited. Keep an eye on this page for information about future Barbecue Heritage Dinners. Now you don’t have to choose! You can buy an Empire Eats giftcard that you can use at any of our six restaurants: Sitti, Gravy, The Pit, The Raleigh Times Bar and The Morning Times. You can still purchase individual restaurant giftcards at the restaurant. Now you don't have to choose! You can buy an Empire Eats giftcard that you can use at any of our six restaurants! Copyright© 2019 Empire Eats. All Rights Reserved.